Invisalign® take a modern approach to straightening teeth, using a custom made series of aligners created for you and only you. 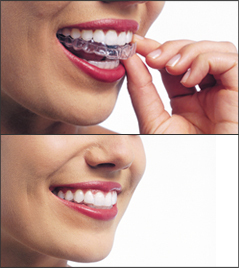 These aligner trays are made of smooth, comfortable and virtually invisible plastic that you simply wear over your teeth. Wearing the aligners will gradually and gently shift your teeth into place, based on the exact movements your dentist plans out for you. There are no metal brackets to attach and no wires to tighten. You simply pop in a new set of aligners approximately every two weeks, until your treatment is complete and you achieved the confident smile you've always wanted. The best part about the whole process is that most people won't even know you're straightening your teeth. Time for a snack? No problem. Take out your aligners to eat or drink whatever you want. Since Invisalign® is virtually invisible, chances are no one will even notice anything is different, until your new smile is revealed, of course. You can remove your Invisalign® aligners, so you can brush and floss regularly and keep your teeth and gums healthy. Special occasion coming up? No problem—just take out your aligners for that time and pop them back in when you’re ready. Of course, even when you’re wearing them, most people won’t even know you’re going through treatment because they’re virtually invisible! Be yourself with Invisalign®. Since it’s clear, you don’t have to hide your smile while going through treatment. Invisalign® appointments work with your schedule. Most visits are in and out, with a quick progress check every few weeks. There are many factors that determine the cost of your Invisalign® treatment: how extensive the issues you want corrected, how long your treatment plan will last, and the specific treatment details prescribed. If you would like more information about Invisalign® or to schedule a complimentary consultation, please contact our office.